The lawsuit, filed in King County Superior Court on Wednesday, counters claims by the team that Martin did not approach anybody with complaints of racial and gender discrimination before making a series of accusatory Instagram posts last month that led to her termination. A wrongful-termination lawsuit filed by Dr. Lorena Martin, the Mariners’ former high-performance director, alleges she went to team owners John Stanton and Buck Ferguson and CEO Kevin Mather as far back as March to complain about alleged discriminatory treatment. The lawsuit, filed in King County Superior Court on Wednesday, counters claims by the team that Martin did not approach anybody with complaints of racial and gender discrimination until a few weeks before before making a series of accusatory Instagram posts last month that led to her termination. The lawsuit states Mather, after hearing Martin’s complaints that she was “being treated differently’’ by general manager Jerry Dipoto, vowed to address the matter and put a stop to what Mather viewed as bullying. According to the suit, when Martin tried to inform Stanton by telephone about her “mistreatment” that same month — without specifying whether she mentioned gender or race directly to him — he cut her off and said he didn’t handle such matters, and he added it was up to Mather and Dipoto to address them. The suit says Stanton also told Martin she should refrain from contacting minority-owner Ferguson about her issues. The lawsuit claims that despite the requirements of Martin’s contract, the team severely curtailed her role and responsibilities. Martin also said that Dipoto, manager Scott Servais and player personnel director Andy McKay shared an unflattering view of Latino players. The lawsuit says several Latino players complained to Martin about feeling excluded. It also says Dipoto and Servais took midseason steps to deliberately undermine the progress and mental state of Mariners star pitcher Felix Hernandez. Servais, according to the lawsuit, felt Hernandez was lazy, and the manager had even taken to “gambling money” – it does not specify how much or with whom – on what the pitcher’s training schedule would be at any given time. Finally, the lawsuit says Dipoto blamed Latino players for ruining the team’s clubhouse culture and a second-half collapse that left the Mariners out of the playoffs for the 17th consecutive season. The statements made in the lawsuit have yet to be proven as fact in court and the Mariners have yet to give any legal response to them. Major League Baseball is investigating the allegations. An email by owner Stanton to employees last month, first published by The Athletic, said a “thorough internal review” by the team of Martin’s racism and gender discrimination allegations concluded them to be unfounded. Martin was relieved of her duties Oct. 10, but the lawsuit says she was only placed on “administrative leave” then and continued to be paid while the team tried to negotiate a permanent severing of their relationship. 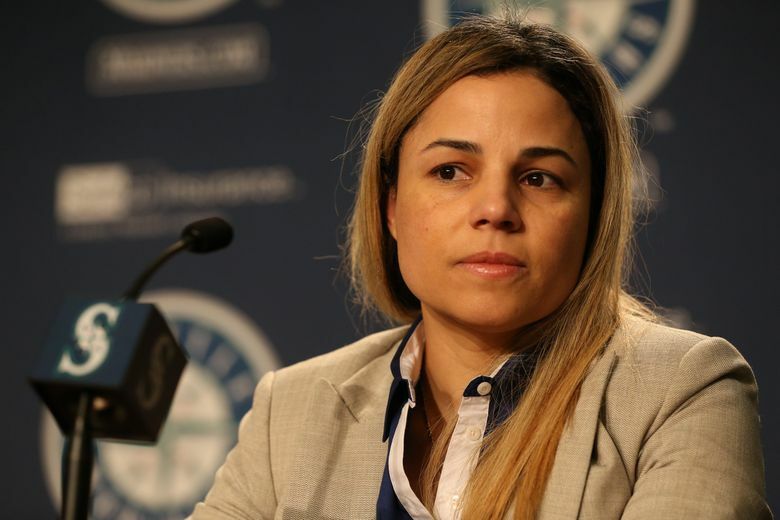 Over the next month, the lawsuit states, the Mariners offered her a choice to resign and take less severance than her contract called for or agree to participate in an internal investigation of her work that she believed was a pretense to firing her. Her status was unresolved and she was a paid employee, the lawsuit states, when she made her Nov. 12 posts on social media accusing Dipoto, Servais and McKay of poor leadership and being discriminatory toward Latino players and employees. It wasn’t until three days after those posts, the lawsuit states, that the Mariners terminated her. The Mariners, in responding to Martin’s social-media posts, had termed her accusations “outrageous’’ and “false’’ and said she hadn’t made any of the allegations “until after she was relieved of her duties” in October. Hired to much fanfare in October 2017, Martin makes clear in the lawsuit that her relationships with Dipoto, McKay and Servais began spiraling within weeks. The lawsuit states that Dipoto called her a “cocky Latina” and McKay called her “stupid” in a January 2018 meeting, and that Servais and Dipoto had made disparaging remarks about Latino players in subsequent meetings that month. Martin alleges in the lawsuit that she’d also complained about concerns of “racial bias and gender discrimination” throughout the season to various Mariners human-resources officials – including the department’s director, vice-president Lisa Winsby – as well as employee assistance director Andy Bottin, team physician Dr. Stanley Herring and Roger Hansen, a special assistant to Dipoto. Despite those complaints, the lawsuit alleges, Martin’s situation with the team only worsened as the season progressed, and her responsibilities were stripped or diminished. By August, the lawsuit states, Dipoto told her Latino players were ruining the team’s clubhouse culture and that he blamed them for losing games. A month later, the lawsuit states, Dipoto blamed Latino players for the team not making the playoffs. The lawsuit says in July, Dipoto and Servais “took affirmative measures to undermine and harm” star pitcher Hernandez by “messing with” his mental state. The Mariners throughout that month had let it be known they were contemplating pulling Hernandez from the rotation and putting him in the bullpen – which they finally did in early August. Martin contends in the lawsuit that Hernandez had asked the Mariners to allow her to accompany the team on a late-June trip to New York, Boston and Baltimore to train him, and that Dipoto refused. The pitcher subsequently injured his back. The lawsuit seeks an injunction barring the team from continued discriminatory practices and ordering them to implement policies that provide equal opportunities to all employees. She also seeks compensation for past and future financial losses, as well as full severance benefits for a three-year contract that was to have run through October 2020. The lawsuit alleges the team breached its contract with Martin by not giving her any opportunity to remedy her job performance prior to her being relieved of her duties and placed on leave in October. Martin’s lawsuit says the team discriminated against her on the basis of race and gender, failed to provide her a safe working environment and retaliated against her complaints by firing her.